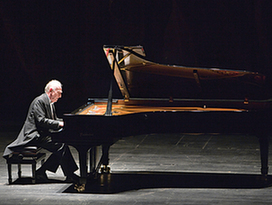 Wall Street is the venue this week for 200 hours of Chopin performances by an eclectic line-up of pianists. Wall Street might not seem like the obvious location for a celebration of the 200th anniversary of the birth of romantic composer Frederic Chopin, but it& #39;s the venue this week for 200 hours of Chopin performances by an eclectic line-up of pianists. As they take a break from their workday, Wall Street traders and office workers can join the global celebration of Chopin& #39;s birthday and take stock of the vast and beloved repertoire of Poland& #39;s most illustrious composer. Waltzes, mazurkas, sonatas, nocturnes, impromptus, and etudes are all on offer with performances daily from 9 a.m. to 7 p.m. on four different pianos placed at various locations in the World Financial Center& #39;s street and lobby levels. "Chopin& #39;s great talent lay in his ability to compose music that was both technically demanding yet accessible to a wide audience," said Debra Simon, artistic director of the World Financial Center. Each evening at 7:00 p.m., the venue& #39;s Winter Garden main stage will echo with the sound of a free solo concert by a roster of classical piano virtuosos, including Claire Huangci, winner of the Chopin Competition of Europe. Each morning, the pianos are available to any amateur pianist eager to sit down and play Chopin for the public. From noon until 7 p.m. a tag team of concert pianists, rising young performers, and students in leading conservatories and training programs will take over. Daytime performers include piano students from The Julliard School, Mannes, Brooklyn College, New York University, Manhattan School of Music, City University of New York (CUNY), Stony Brook, Rutgers, Queens College, Montclair State University, Ithaca College and Shenandoah University, as well as several well-known community music schools. Featured pianos include instruments from Fazioli and Hamburg Steinway, Shigeru Kawai, Bosendorfer and Sauter.